This article is about modern ethnic groups. For other uses, see Pygmy (disambiguation). In anthropology, pygmy peoples are ethnic groups whose average height is unusually short. The term pygmyism is used to describe the phenotype of endemic short stature (as opposed to disproportionate dwarfism occurring in isolated cases in a population) for populations in which adult men are on average less than 150 cm (4 ft 11 in) tall. The term is primarily associated with the African Pygmies, the hunter-gatherers of the Congo basin (comprising the Bambenga, Bambuti and Batwa). The term "pygmoid" is a traditional morphological racial category for the Central African Pygmies, considered a subgroup of the Negroid category. The term "Asiatic Pygmies" has been used of the Negrito populations of Maritime Southeast Asia and other Australoid peoples of short stature. The Taron people of Myanmar are an exceptional case of a "pygmy" population of East Asian phenotype. The term pygmy, as used to refer to diminutive people, derives from Greek πυγμαῖος pygmaios via Latin Pygmaei (sing. Pygmaeus), derived from πυγμή – meaning a fist, or a measure of length corresponding to the distance between the elbow and knuckles. (See also Greek pechus.) In Greek mythology the word describes a tribe of dwarfs, first described by Homer, the ancient Greek poet, and reputed to live in India and south of modern-day Ethiopia. Various theories have been proposed to explain the short stature of pygmies. Some studies suggest that it could be related to adaptation to low ultraviolet light levels in rainforests. This might mean that relatively little vitamin D can be made in human skin, thereby limiting calcium uptake from the diet for bone growth and maintenance, and leading to the evolution of the small skeletal size. Other explanations include lack of food in the rainforest environment, low calcium levels in the soil, the need to move through dense jungle, adaptation to heat and humidity, and as an association with rapid reproductive maturation under conditions of early mortality. (See also Aeta people § Demographics.) Other evidence points towards unusually low levels of expression of the genes encoding the growth hormone receptor and growth hormone compared to the related tribal groups, associated with low serum levels of insulin-like growth factor-1 and short stature. African pygmies live in several ethnic groups in Rwanda, Burundi, Uganda, the Democratic Republic of the Congo (DRC), the Republic of Congo (ROC), the Central African Republic, Cameroon, the Equatorial Guinea, Gabon, Angola, Botswana, Namibia, Madagascar, and Zambia. There are at least a dozen pygmy groups, sometimes unrelated to each other. 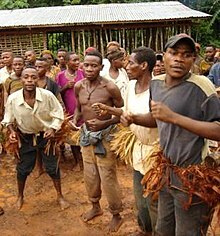 The best known are the Mbenga (Aka and Baka) of the western Congo basin, who speak Bantu and Ubangian languages; the Mbuti (Efe etc.) of the Ituri Rainforest, who speak Bantu and Central Sudanic languages, and the Twa of the African Great Lakes, who speak Bantu Rundi and Kiga. Most pygmy communities are partially hunter-gatherers, living partially but not exclusively on the wild products of their environment. They trade with neighbouring farmers to acquire cultivated foods and other material items; no group lives deep in the forest without access to agricultural products. It is estimated that there are between 250,000 and 600,000 Pygmies living in the Congo rainforest. However, although Pygmies are thought of as forest people, the groups called Twa may live in open swamp or desert. Distribution of Pygmies and their languages according to Bahuchet (2006). The southern Twa are not shown. Some 30% of Aka language is not Bantu, and a similar percentage of Baka language is not Ubangian. Much of pygmy vocabulary is botanical, dealing with honey collecting, or is otherwise specialized for the forest, and is shared between the two western pygmy groups. It has been proposed that this is the remnant of an independent western pygmy (Mbenga or "Baaka") language. However, this type of vocabulary is subject to widespread borrowing among the Pygmies and neighboring peoples, and the "Baaka" language was only reconstructed to the 15th century. African pygmy populations are genetically diverse and extremely divergent from all other human populations, suggesting they have an ancient indigenous lineage. Their uniparental markers represent the second-most ancient divergence right after those typically found in Khoisan peoples. Recent advances in genetics shed some light on the origins of the various pygmy groups. Researchers found "an early divergence of the ancestors of pygmy hunter–gatherers and farming populations 60,000 years ago, followed by a split of the Pygmies' ancestors into the Western and Eastern pygmy groups 20,000 years ago." New evidence suggests East and West African pygmy children have different growth patterns. The difference between the two groups may indicate the Pygmies’ short stature did not start with their common ancestor, but instead evolved independently in adapting to similar environments, which adds support that some sets of genes related to height were advantageous in Eastern pygmy populations, but not in Western pygmy populations. However, Roger Blench (1999) argues that the Pygmies are not descended from residual hunter-gatherer groups, but rather are offshoots of larger neighboring ethnolinguistic groups that had adopted forest subsistence strategies. Blench notes the lack of clear linguistic and archaeological evidence for the antiquity of pygmy cultures and peoples, and also notes that the genetic evidence can be problematic. Blench (1999) also notes that there is no evidence of the Pygmies have hunting technology distinctive from that of their neighbors, and argues that the short stature of pygmy populations can arise relatively quickly (in less than a few millennia) due to strong selection pressures. The African Pygmies are particularly known for their usually vocal music, usually characterised by dense contrapuntal communal improvisation. Simha Arom says that the level of polyphonic complexity of pygmy music was reached in Europe in the 14th century, yet pygmy culture is unwritten and ancient. Music permeates daily life and there are songs for entertainment as well as specific events and activities. The pygmy population was a target of the Interahamwe during the 1994 Rwandan Genocide. Of the 30,000 Pygmies in Rwanda, an estimated 10,000 were killed and another 10,000 were displaced. They have been described as "forgotten victims" of the genocide. From the end of 2002 through January 2003 around 60,000 pygmy civilians and 10,000 combatants were killed in an extermination campaign known as "Effacer le Tableau" during the Second Congo War. Human rights activists have made demands for the massacre to be recognized as genocide. In the Republic of the Congo, where Pygmies make up 2% of the population, many Pygmies live as slaves to Bantu masters. The nation is deeply stratified between these two major ethnic groups. The pygmy slaves belong to their Bantu masters from birth in a relationship that the Bantus call a time-honored tradition. Even though the Pygmies are responsible for much of the hunting, fishing and manual labor in jungle villages, Pygmies and Bantus alike say that Pygmies are often paid at the master's whim: in cigarettes, used clothing, or simply not paid at all. As a result of pressure from UNICEF and human-rights activists, in 2009, a law that would grant special protections to the pygmy people was awaiting a vote by the Congo parliament. According to reports made in 2013, this law was never passed. In Northern Katanga Province starting in 2013, the pygmy Batwa people, whom the Luba people often exploit and allegedly enslave, rose up into militias, such as the "Perci" militia, and attacked Luba villages. A Luba militia known as "Elements" attacked back. More than a thousand people were killed in the first eight months of 2014 alone with the number of displaced people estimated to be 650,000 as of December 2017. The weapons used in the conflict are often arrows and axes, rather than guns. Historically, the pygmy have always been viewed as inferior by both colonial authorities and the village-dwelling Bantu tribes. 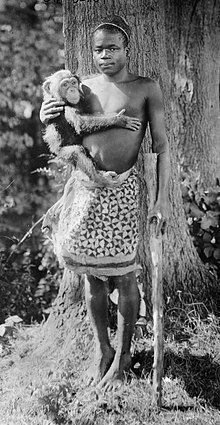 Pygmy children were sometimes captured during the period of the Congo Free State, which exported pygmy children to zoos throughout Europe, including the world's fair in the United States in 1907. Pygmies are often evicted from their land and given the lowest paying jobs. At a state level, Pygmies are sometimes not considered citizens and are refused identity cards, deeds to land, health care and proper schooling. The Lancet published a review showing that pygmy populations often had worse access to health care than neighboring communities. Negritos in Southeast Asia (including the Batak and Aeta of the Philippines, the Andamanese of the Andaman Islands, and the Semang of the Malay Peninsula) are sometimes called pygmies (especially in older literature). Negritos share some common physical features with African pygmy populations, including short stature and dark skin. The name "Negrito", from the Spanish adjective meaning "small black person", was given by early explorers. The explorers who named the Negritos assumed the Andamanese they encountered were from Africa. This belief was, however, discarded by anthropologists who noted that apart from dark skin, peppercorn hair, and steatopygia, the Andamanese had little in common with any African population, including the African pygmies. Their superficial resemblance to some Africans and Melanesians is thought to be due to living in a similar environment, or simply retentions of the initial human form. Their origin and the route of their migration to Asia is still a matter of great speculation. They are genetically distant from Africans, and have been shown to have separated early from Asians, suggesting that they are either surviving descendants of settlers from the early out-of-Africa migration of the Great Coastal Migration of the Proto-Australoids, or that they are descendants of one of the founder populations of modern humans. The "Rampasasa pygmies" of Flores, Indonesia gained some attention in the early 2000s in connection with the nearby discovery of Homo floresiensis. Australian anthropologist Norman Tindale and American anthropologist Joseph Birdsell suggested there were 12 Negrito-like tribes of short-statured Aboriginal peoples living on the coastal and rainforest areas around Cairns on the lands of the Mbabaram people and Djabugay people. Birdsell found that the average adult male height of Aboriginal people in this region was significantly less than that of other Aboriginal Australian groups; however, it was still greater than the maximum height for classification as a pygmy people, so the term 'pygmy' may be considered a misnomer. He called this short-statured group Barrineans, after Lake Barrine. Birdsell classified Aboriginal Australians into three major groups, mixed together to varying degrees: the Carpentarians, best represented in Arnhem Land; the Murrayans, centred in southeastern Australia; and the Barrineans. He argued that people related to Oceanic Negritos were the first arrivals, and had been absorbed or replaced over time by later incoming peoples; the present-day Barrineans retained the greatest proportion of ancestry from this original Negrito group, "[b]ut this is not to say that the Barrineans are Negritos... the Negritic component is clearly subordinate, and... the preponderant element is Murrayian." This trihybrid model is generally considered defunct today; craniometric, genetic, and linguistic evidence does not support a separate origin of Barrinean or other Aboriginal groups, and physical differences between Aboriginal groups can be explained by adaptation to differing environments. In 2002 the (former) existence of short-statured people in Queensland was brought into the public eye by Keith Windschuttle and Tim Gillin in an article published by the right-wing Quadrant magazine (edited by Windschuttle himself). The authors argued that these people were evidence for a distinct Negrito population in support of Birdsell's theory, and claimed that "the fact that the Australian pygmies have been so thoroughly expunged from public memory suggests an indecent concurrence between scholarly and political interests", because evidence of descent from earlier or later waves of origin could lead to conflicting claims of priority by Aboriginal people and hence pose a threat to political co-operation among them. This and other publications promoting the trihybrid model drew several responses, which went over the current scientific evidence against the theory, and suggested that attempts to revive the theory were motivated by an agenda of undermining Aboriginal and Torres Strait Islander claims to native title. Norman Gabel[year needed] mentions that rumours exist of pygmy people in the interior mountains of Viti Levu in Fiji, but explains he had no evidence of their existence.E.W. Gifford[year needed] reiterates Gabel's statement and claims that tribes of pygmies in the closest proximity to Fiji would most likely be found in Vanuatu. In 2008, the remains of at least 25 miniature humans, who lived between 1,000 and 3,000 years ago, were found on the islands of Palau in Micronesia. During the 1900s when Vanuatu was known as New Hebrides, sizable pygmy tribes were first reported throughout northeastern Santo. It is likely that they are not limited to this region of New Hebrides. Nonetheless, there is no anthropological evidence linking pygmies to other islands of Vanuatu. Frank Kingdon-Ward in the early 20th century reported a tribe of pygmy Tibeto-Burman speakers known as the Taron inhabiting the remote region of Mt. Hkakabo Razi in Southeast Asia on the border of China (Yunnan and Tibet), Burma, and India. A Burmese survey done in the 1960s reported a mean height of an adult male Taron at 1.43 m (4'6") and that of females at 1.40 m (4'5"). These are the only known "pygmies" of clearly East Asian descent. The cause of their diminutive size is unknown, but diet and endogamous marriage practices have been cited. The population of Taron pygmies has been steadily shrinking, and is now down to only a few individuals. In 2013, a link between the Taron and the Derung people in Yunnan, China, was uncovered by Richard D. Fisher, which may indicate the presence of pygmy populations among the Derung tribe. ^ Encyclopædia Britannica: Pygmy Archived 2007-03-28 at the Wayback Machine. Britannica.com. Retrieved on 2011-10-11. ^ Egon Freiherr von Eickstedt (1934), cited by John Murphy, The Origins and History of Religions, Manchester University Press (1949), p. 52. ^ The Armand de Quatrefages, Armand de Quatrefages de Bréau, Pygmies (1895). ^ pygmy Archived 2013-10-29 at the Wayback Machine. Online Etymology Dictionary. ^ Hewlett, Barry S. "Cultural diversity among African pygmies." In: Cultural Diversity Among Twentieth-Century Foragers Archived 2010-06-09 at the Wayback Machine. Susan Kent, ed. Cambridge, England: Cambridge University Press, 1996. ^ a b c Forest peoples in the central African rain forest: focus on the pygmies Archived 2016-10-25 at the Wayback Machine. ^ Becker, Noémie S.A.; Verdu, Paul; Froment, Alain; Le Bomin, Sylvie; Pagezy, Hélène; Bahuchet, Serge; Heyer, Evelyne (2011). "Indirect evidence for the genetic determination of short stature in African Pygmies" (PDF). American Journal of Physical Anthropology. 145 (3): 390–401. doi:10.1002/ajpa.21512. PMID 21541921. ^ Julian O'Dea (December 21, 2009). "Ultraviolet light levels in the rainforest". ^ O'Dea, JD. Possible contribution of low ultraviolet light under the rainforest canopy to the small stature of Pygmies and Negritos. Homo: Journal of Comparative Human Biology, Vol. 44, No.3, pp. 284–7, 1994. ^ Short lives, short size – why are pygmies small? « Not Exactly Rocket Science Archived 2012-03-24 at the Wayback Machine. ^ Bozzola, M; Travaglino P; Marziliano N; Meazza C; Pagani S; Grasso M; Tauber M; Diegoli M; Pilotto A; Disabella E; Tarantino P; Brega A; Arbustini E (November 2009). "The shortness of Pygmies is associated with severe under-expression of the growth hormone receptor". Mol Genet Metab. 98 (3): 310–3. doi:10.1016/j.ymgme.2009.05.009. PMID 19541519. . Dávila N, Shea BT, Omoto K, Mercado M, Misawa S, Baumann G, "Growth hormone binding protein, insulin-like growth factor-I and short stature in two pygmy populations from the Philippines", J Pediatr Endocrinol Metab. 2002 Mar;15(3), 269-276. ^ World Bank accused of razing Congo forests Archived 2016-05-13 at the Wayback Machine, The Guardian. ^ a b c Sheshadri, Raja. "Pygmies in the Congo Basin and Conflict." Archived 2016-03-04 at the Wayback Machine no.163 (2005): ICE Case Studies, American University (Mar 24, 2010). ^ R. Blench and M. Dendo. Genetics and linguistics in sub-Saharan Africa Archived 2011-07-21 at the Wayback Machine, Cambridge-Bergen, June 24, 2004. ^ Klieman, Kairn A. The Pygmies Were Our Compass: Bantu and BaTwa in the History of West Central Africa, Early Times to c. 1900, Heinemann, 2003. ^ Luigi Luca Cavalli-Sforza (1986). African pygmies. Academic Press. ISBN 978-0-12-164480-2. Retrieved 11 October 2011. ^ a b Patin, E.; Laval, G.; Barreiro, L. B.; Salas, A.; Semino, O.; Santachiara-Benerecetti, S.; Kidd, K. K.; Kidd, J. R.; et al. (2009). Di Rienzo, Anna (ed.). "Inferring the Demographic History of African Farmers and Pygmy Hunter–Gatherers Using a Multilocus Resequencing Data Set". PLoS Genetics. 5 (4): e1000448. doi:10.1371/journal.pgen.1000448. PMC 2661362. PMID 19360089. ^ Becker, Rachel A.; 28, National Geographic PUBLISHED July. "We May Have Been Wrong About How African Pygmies Grow". National Geographic News. Archived from the original on 2015-07-29. Retrieved 2015-07-28. ^ Rozzi, Fernando V. Ramirez; Koudou, Yves; Froment, Alain; Le Bouc, Yves; Botton, Jérémie (2015-07-28). "Growth pattern from birth to adulthood in African pygmies of known age". Nature Communications. 6: 7672. doi:10.1038/ncomms8672. PMC 4525207. PMID 26218408. Archived from the original on 2015-07-31. ^ Blench, Roger. 1999. Are the African Pygmies an ethnographic fiction Archived 2015-04-20 at the Wayback Machine? In: Central African hunter-gatherers in a multi-disciplinary perspective: challenging elusiveness. K. Biesbrouck, S. Elders & G. Rossel eds. 41-60. Leiden: CNWS. ^ "In Rwanda, an estimated 10,000 of the 30,000-strong pygmy community was slaughtered during the Rwandan genocide, making them the "forgotten victims" of the Rwandan genocide." Raja Seshadri (7 November 2005). "Pygmies in the Congo Basin and Conflict". Case Study 163. The Inventory of Conflict & Environment, American University. Archived from the original on 2016-03-04. Retrieved 21 July 2012. ^ Basildon Peta (January 9, 2003). "Rebels 'eating Pygmies' as mass slaughter continues in Congo despite peace agreement". The Independent. Archived from the original on December 26, 2010. ^ "DR Congo Pygmies appeal to UN". BBC News. 23 May 2003. Archived from the original on 13 December 2010. ^ Thomas, Katie (March 12, 2007). "Congo's Pygmies live as slaves". The News & Observer. Archived from the original on 2009-02-28. ^ Nicholas D. Kristof (June 16, 1997). "As the World Intrudes, Pygmies Feel Endangered". New York Times. Archived from the original on July 1, 2017. ^ Racism against Pygmies Archived 2015-04-23 at the Wayback Machine on the Survival International organization's website. ^ James Astill (8 January 2003). "Congo rebels are eating pygmies, UN says". The Guardian. Archived from the original on 29 March 2017. ^ a b "DR Congo: Ethnic Militias Attack Civilians in Katanga". Human Rights Watch. 11 August 2015. Archived from the original on 8 March 2017. Retrieved 7 March 2017. ^ a b "In Congo, Wars Are Small and Chaos Is Endless". nytimes.com. 30 April 2016. Archived from the original on 6 May 2017. Retrieved 7 March 2017. ^ "Displaced Congolese civilians sent back to a widening war". irinnews.com. 11 July 2017. Retrieved 18 July 2017. ^ "Stricken by communal violence and malnutrition in Tanganyika, Democratic Republic of the Congo". International Committee of the Red Cross. 29 December 2017. Retrieved 19 March 2018. ^ Nyang'ori Ohenjo; Ruth Willis; Dorothy Jackson; Clive Nettleton; Kenneth Good; Benon Mugarura (2006). "Health of Indigenous people in Africa". The Lancet. 367 (9526): 1937–1946. doi:10.1016/S0140-6736(06)68849-1. ^ a b Thangaraj, Kumarasamy; et al. (21 January 2003). "Genetic Affinities of the Andaman Islanders, a Vanishing Human Population" (PDF). Current Biology. 13 (2): 86–93(8). doi:10.1016/S0960-9822(02)01336-2. PMID 12546781. Archived from the original (PDF) on 29 October 2008. ^ Kashyap, VK; Sitalaximi, T; Sarkar, BN; Trivedi, R (2003). "Molecular relatedness of the aboriginal groups of Andaman and Nicobar Islands with similar ethnic populations" (PDF). The International Journal of Human Genetics. 3: 5–11. Archived (PDF) from the original on 2009-03-27. ^ Elegant, Simon (2005-05-30). "Bones of Contention". Time. Archived from the original on 2010-10-14. Retrieved 2010-05-22. ""Hobbits" Were Pygmy Ancestors, Not New Species, Study Says". nationalgeographic.com. Archived from the original on 2007-03-18. ^ Hiscock, Peter (2005). "The extinction of rigour: a comment on 'The extinction of the Australian Pygmies' by Keith Windschuttle and Tim Gillin". Aboriginal History. 29: 142–148. JSTOR 24046693. ^ Birdsell, Joseph (1967). "Preliminary Data on the Trihybrid Origin of the Australian Aborigines". Archaeology & Physical Anthropology in Oceania. 2 (2). ^ Larnach; Macintosh (1970). The Craniology of the Aborigines of Queensland. ^ McAllister; et al. (2013). "The Australian Barrineans and Their Relationship to Southeast Asian Negritos: An Investigation using Mitochondrial Genomics". Human Biology. 85 (1). ^ Dixon, R. M. W. (1980). The Languages of Australia. Cambridge University Press. p. 262. ^ Gilligan, Ian; Bulbeck, David (2007). "Environment and morphology in Australian Aborigines: A re-analysis of the Birdsell database". American Journal of Physical Anthropology. 134 (1). ^ Windschuttle, Keith (1 June 2002). "The extinction of the Australian pygmies". Quadrant magazine. Quadrant Magazine Ltd. Retrieved 31 January 2019. ^ Westaway, Michael (13 March 2015). "Who we should recognise as First Australians in the constitution". The Conversation. The Conversation Media Group. Retrieved 31 January 2019. ^ Ross, Anne (June 2010). "Constant Resurrection: The Trihybrid Model and the Politicisation of Australian Archaeology". Australian Archaeology. 70: 55–67. JSTOR 27821565. ^ a b E.W. Gifford. "Anthropological problems in Fiji". Retrieved 3 May 2014. ^ Ian Sample (March 12, 2008). "Pygmy human remains found on rock islands". The Guardian. Archived from the original on December 28, 2016. ^ Lee R. Berger; Steven E. Churchill; Bonita De Klerk1; Rhonda L. Quinn (March 2008). "Small-Bodied Humans from Palau, Micronesia". PLoS ONE. 3 (3): e1780. doi:10.1371/journal.pone.0001780. PMC 2268239. PMID 18347737. ^ P. Christiaan Klieger (2003). Along the Salt Road. California Wild. P.Christiaan Klieger. "A Journey Through Northern Burma: Along the Salt Road". [permanent dead link]High Altitude Anthropology Archived 2008-12-02 at the Wayback Machine. Calacademy.org. Retrieved on 2011-10-11. Rawang People Archived 2009-02-12 at the Wayback Machine. V2.linguistlist.org. Retrieved on 2011-10-11. ^ "The search for 'Dawi'". canyonsworldwide.com. Archived from the original on 8 September 2013. Retrieved 12 August 2013. Mbuti Net Hunters of the Ituri Forest, story with photos and link to Audio Slideshow. By Todd Pitman, The Associated Press, 2010.